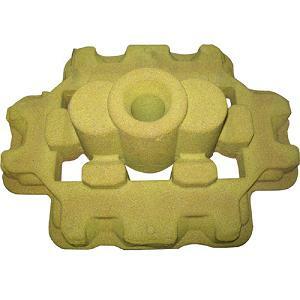 shell mold casting or shell molding is a metal casting process in manufacturing industry in which the mold is a thin hardened shell of sand and thermosetting resin binder, backed up by some other material. Shell molding was developed as a manufacturing process during the mid-20th century in Germany. 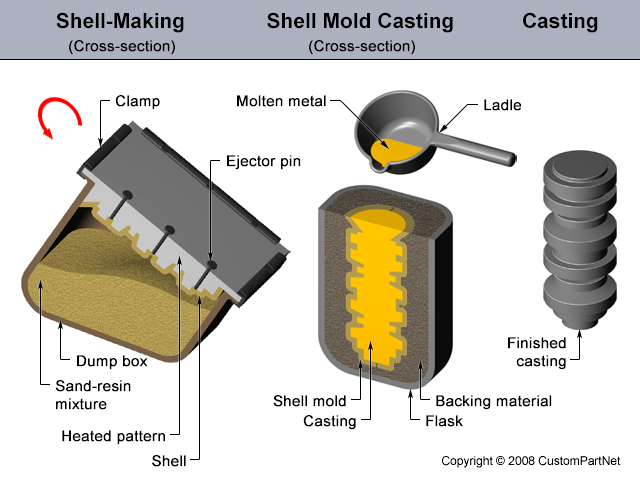 Shell mold casting is particularly suitable for steel castings under 20 lbs; however almost any metal that can be cast in sand can be cast with the shell molding process. Also much larger parts have been manufactured with shell molding. Typical parts manufactured in industry using the shell mold casting process include cylinder heads, gears, bushings, connecting rods, camshafts and valve bodies.